Two-time NCAA All-American in Cross Country at Ithaca College (and the school record holder in steeplechase for seven years), Ian Golden '99 now owns Finger Lakes Running & Triathalon Company in downtown Ithaca. Golden works hard to find the perfect shoe for every customer. Not only does he know about running, but he holds both bachelor's and master's degrees in occupational therapy. Do you want to start exercising but don't know where to start? As an Ithaca College student, you can work with a personal trainer at the Fitness Center. Sign up for this low-cost service, and you'll get a personalized workout plan that will help you stay in shape. You’ve probably heard the horror stories about friends or siblings who came home for Thanksgiving break with the dreaded “freshman 15” filling out their college hoodies. Much of that can be chalked up to being in a new place and getting used to a new routine that includes a buffet-style free-for-all at every meal. 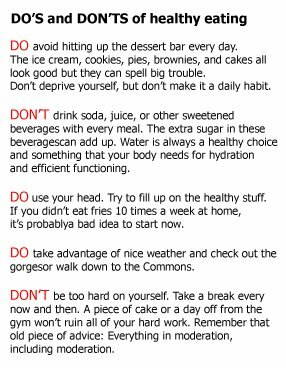 But don’t panic -- the freshman 15 is not inevitable. The good news is that campuses all around the country are now catering to the health-conscious student, and Ithaca College is no exception. 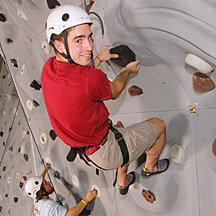 In fact, IC was ranked as one of the 25 most physically fit colleges in the nation by Men’s Fitness magazine in 2006. Whether you want to maintain good fitness habits or find opportunities to cultivate new ones, there are so many fun and different ways to be active at IC that getting and staying fit should be a breeze. Ithaca’s centrally located Fitness Center is free to all IC students. It boasts floor-to-ceiling windows, an awesome sound system, and huge locker rooms. Inside you’ll find rows of treadmills, elliptical machines, arc-trainers, stair steppers, ergometers, weight machines,and tons of free weights -- even an indoor climbing wall. The variety of equipment makes it a snap to vary your routine to keep things interesting and challenge yourself. Take a quick video tour of the Fitness Center. The Fitness Center also offers free aerobics classes like kickboxing, stepfunk, and spinning. If you want some customized tips, sign up for a (very reasonably priced) session with one of the personal trainers, all of whom are health sciences students. If you prefer to chill out while you burn some calories, yoga and Pilates classes are also available. But if the gym isn’t your thing, there are plenty of other options to keep you moving. Hiking one of Ithaca’s famous gorges is a great way to get some exercise when the weather’s nice. There are many trails and paths you can explore while getting a great uphill workout. And don’t beat yourself up if you miss a day at the gym; even just walking around campus and hilly Ithaca counts as exercise. If you love exercising outdoors but don’t want to drive to a gorge or state park, cross-country trails behind the Terraces residence halls (download a map at right) and the South Hill Recreation Way, located just off campus, are great places to walk, jog, or ride your bike. The latter is a shady path that snakes through South Hill for over three miles. Playing club sports is another great way to get some exercise (and meet new people!) without having to drag yourself to the gym. You don’t have to be a star athlete to participate -- club sports and intramurals are all about camaraderie and enjoying yourself. Ithaca College’s sport club program offers 38 competitive, performance, and recreational sports, so you can chose the level that’s right for you. There are a lot of options, from Frisbee to badminton to cross-country skiing. It’s a perfect chance to take up an old hobby or try something new. Exercise is only half the battle. Eating well is also important. If you find it hard to control yourself around all-you-can-eat ice cream stations, you can take advantage of the Balanced Way meal plan. It’s available in all dining halls and features a plate containing balanced portions of starches, vegetables, and meats. It’s a great way to take the guesswork out of your meals and make sure you get the nutrition your body needs. One thing that can really pack on the pounds is alcohol. Not only is alcohol illegal if you’re under 21 but it provides empty calories and can lead to more bad food choices. Sober people generally don’t order an extra-cheese pizza at 3:30 in the morning. Keep those party nights to a minimum; it’ll be good for your health and your GPA. Above all, trust your common sense. As long as you strike a healthy balance between moderation and indulgence, you’ll be fine and in great shape come Thanksgiving.